On Tuesday Oct 30, 2018, it was reported that Jin Yong, whose real name is Louis Cha, has died after a long illness. I just heard the devastating news and I am deeply saddened. 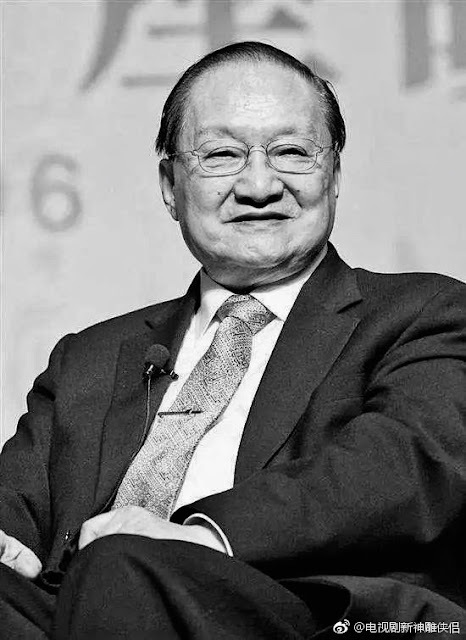 Jin Yong was and will always be a legend. Despite his old age, he was to me the kind of person that would continue to live on for a very long time. He had earned his degree in Cambridge when he was already in his eighties so I’m shocked by his sudden passing. Every c-drama blogger can probably attest to Jin Yong’s impact not only in the world of wuxia but also in shaping a generation. I have fond memories watching Jin Yong dramas growing up and it is still a large part of my life even up to today. It truly feels like the end of an era, but at the same time it isn’t because I know his works will live on and influence many generations to come. Thank you for sharing your wonderful imagination to the world. May you rest in peace. In memory of Jin Yong, below are some of the many adaptations based on his novels. The best-selling author has sold over 300 million copies of his works worldwide. Rest in peace. Thank you for all the wuxia characters that you've created, they were my childhood heroes and Xiao Long Nu will always be my first love. Thank you for all the fun. Thank you for the memories. Thank you for your legacy. So sad. It is no understatement that this man's stories have defined and shaped the industry over the decades and have become household names. His canonical stories are still being adapted every few years, and just about every well-known Chinese celebrity seems to have acted in an adaptation at some point in their lives, some even gaining popularity because of it. His stories will live on forever. RIP. JIn Yong really paved the way for a lot of actors and actresses to stardom and his novels are epic given that they are all very original. His legacy will remain for many generations to come. His works are definitely epic, with captivating story and characters. I was introduced to C dramas through his wuxia works. He has great imagination, knowledge, and writing skill. Honestly, I havent found other wuxias that I like better than his. The best wuxia novelist ever imo. His books were a huge part of my childhood. RIP. RIP! I agree with many here - childhood would not have been the same. His novels are great contribution to Chinese literature and defined the Wuxia genre.